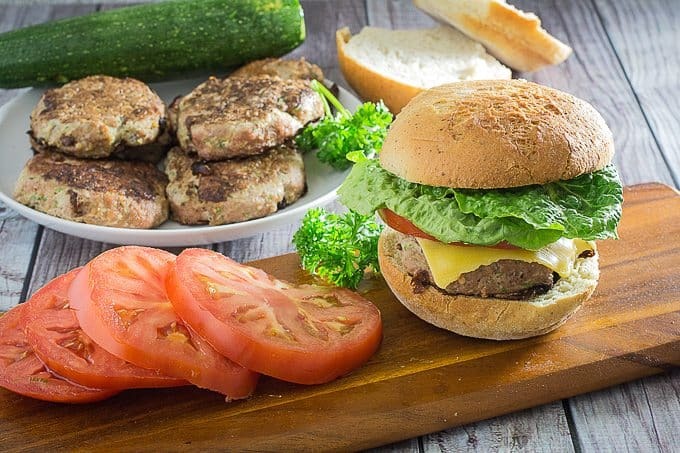 Turkey Zucchini Burgers are the perfect way to get your protein in during the day. Lean ground turkey combined with grated zucchini and a blend of herbs and spices, then grilled to perfection. Flavorful, juicy, and only 200 calories! It’s Monday, and you know what that means, don’t you? That’s right, it’s healthy eating day! Because we’ve all had a little bit too much fun over the weekend, and it’s time to get right back on track. We have #goals here, people! And that’s why I’m giving you a recipe full of nutritious veggies and lean protein, along with some savory flavors like tamari (gluten free soy sauce), parsley, garlic, and onion powder. 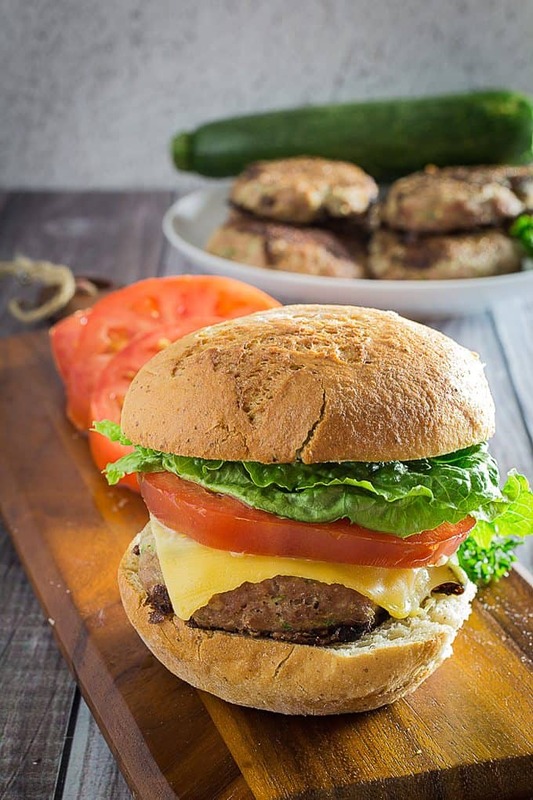 Turkey Zucchini Burgers are seriously juicy, full of flavor, and perfect for lunch or dinner. 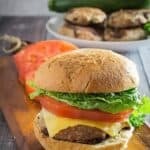 Stack these burgers sky-high with lettuce, tomato, cheese, or whatever your heart desires, while knowing you’re starting the week off on a great note! When I say stack these burgers sky-high, I’m being completely serious. How much do you think we can fit on top of this burger, and still be able to eat it in the end? Personally, I’d say this is a challenge. Challenge accepted! For tonight, I went with the classic lettuce, tomato, mustard, and American cheese on a gluten free bun. Tomorrow, who knows? Maybe I’ll get a little crazy and add some onion. Or, even better, sautéed onion! And mushrooms, with swiss! Oh, the possibilities are endless here. Get creative! Here’s the trick to keeping these bad boys incredibly melt-in-your-mouth juicy. Are you ready? Here it is… Only flip them once. Yep, that’s it. It’s that simple. 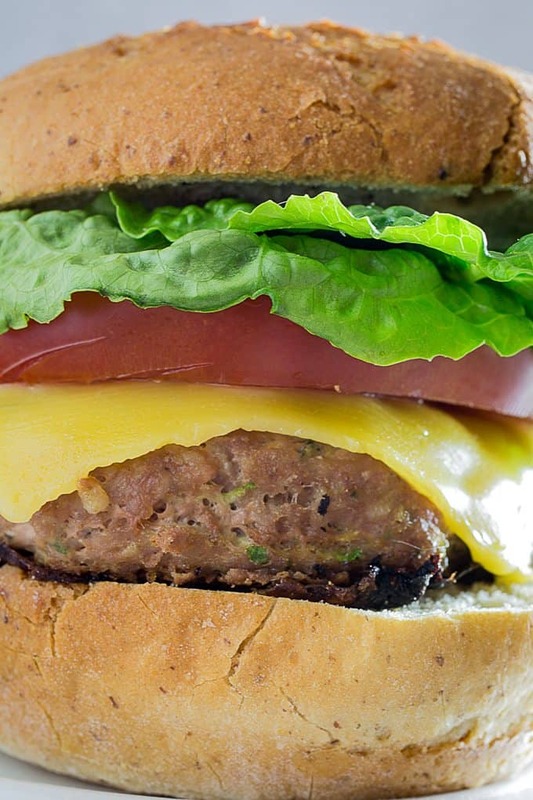 For turkey burgers, that’s a little bit easier said than done. You need to really be sure that they’re cooked through enough on each side. For me, that’s about 5 minutes per side. My skillet averages between 375F-400F, depending on how I set it. Once you’ve made these a few times, it’ll be a lot easier. As a pro, you’ll be able to tell from the sides if it’s cooked up enough. 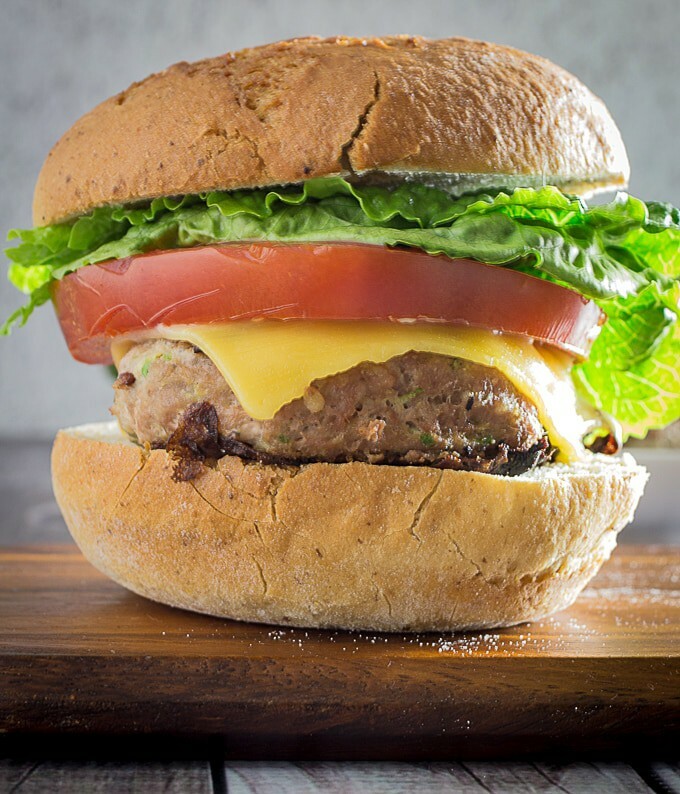 Another thing you can look for is if the juices look like they’re coming out clear, and use a thermometer to measure the internal temperature of the burger. For poultry, you should be bringing them to 165F in the very center of the patty. You can read all about safe cooking temperatures on the USDA blog over here. Ok, can we talk about the picture above for a second? It looks pretty good, right? And pretty… close? 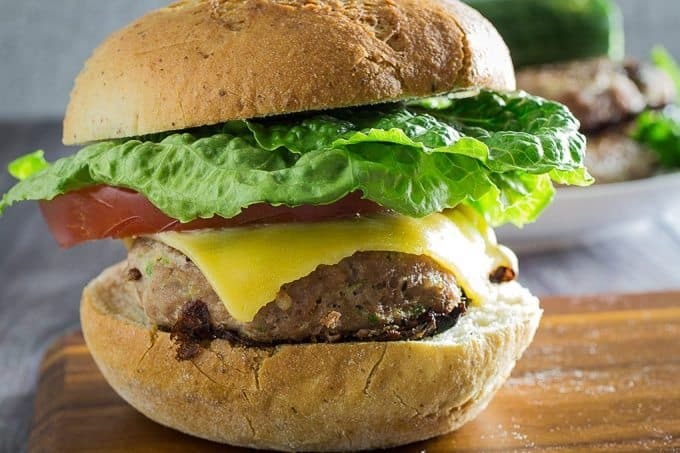 This is Andrew’s pride and joy of the zucchini turkey burger photos today. He especially likes that you can see the little bits of zucchini right in the burger. To me, it looks a little bit like you set the burger about two inches from your face, in preparation for the biggest bite you’ve ever taken in your life. Give that burger a pep talk! To be honest though, I really like it, too. In a large bowl, mix all ingredients together until well combined. Form into 7-8 burgers. In a large skillet over medium heat, cook burgers for about 5 minutes on each side, or until turkey is thoroughly cooked through.